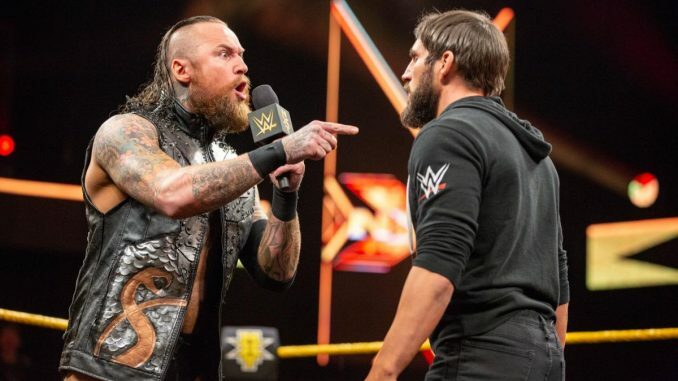 John Pollock goes through this week's episode of NXT with Johnny Gargano challenging Aleister Black, Punishment Martinez's debut, Baszler vs. Kai & more. -This week’s show saw the start of the push for the TakeOver: Phoenix in January with a show-closing segment involving Tommaso Ciampa, Aleister Black, and Johnny Gargano. Black stated he was invoking his rematch clause to challenge Ciampa at the January 26th event and was immediately interrupted by Gargano. Ciampa played the puppet master and suggested they end their feud with a steel cage match and both agreed to it. I thought Black came off as a superstar in this segment, cutting a great promo on Gargano and then blindsiding Ciampa on the apron with a Black Mass out of nowhere. His delivery of the move is unexpected and always gets over. -Shayna Baszler defeated Dakota Kai in a non-title match. This the match Kai needed to establish some credibility after being the victim of Baszler’s bullying for so long. This was Kai’s match to fight back and take Baszler to the limit. Baszler went to stomp the elbow, Kai moved and allowed Baszler to snap the arm back like Pentagon Jr. Kai refused to stay down and fought back with a face wash and running boot to the corner while clutching the injured arm. Kai wouldn’t stay down, eventually had her knee kicked out and Baszler put her out with the Kirifuda clutch. It was a very good performance from both, specifically Kai, who this was designed to make a serious threat. Jessamyn Duke and Marina Shafir attacked Kai and led to Io Shirai making the save and chasing them off. Kairi Sane was held off the tapings due to illness and was the reason she was absent. -One of the standouts of this show was the performance of Humberto Carrillo in the tag match with Raul Mendoza against Steve Cutler and Wesley Blake. I liked Carrillo’s offense a lot, including this gorgeous missile dropkick where he gets a lot of hang time on it. Everything he did looked smooth and impressed me a lot in the tag match. Cutler came off the top with a stomp onto Carrillo into a Scorpion Death Drop by Blake and he took the fall. -Punishment Martinez (using that name) made his television debut in a short match with Matt Riddle. The audience reacted modestly for Martinez and recognized him. Martinez got to escape a rear-naked choke attempt and landed a cyclone kick. Riddle dropped him with a head kick, Martinez fought the Bro Mission, but Riddle slapped his chest repeatedly and locked it on for the quick tap. Kassius Ohno attacked Riddle from behind on the ramp and sets up another match between them for television. -There was a feature on Ricochet. I like that they are constantly replaying the double moonsault spot from War Games so people don’t forget about it and that’s the challenge in creating an all-time memorable spot. Coincidentally, Wednesday is the anniversary of TNA Turning Point 2004 and while I doubt anyone remembers that show, I guarantee you remember when Elix Skipper scaled the steel cage and landed a huracanrana off it. The reason is they replayed that spot forever and it’s an all-time highlight reel moment. -The four-way women’s match to determine the next title challenger for Shayna Baszler will air on December 26th. Bianca Belair is the first entrant announced for the match. -Next week’s show will feature EC 3 taking on Bobby Fish and Ricochet defending the North American title against a mystery opponent (not on the NXT roster). -I thought the episode moved well, the closing segment was strong, and I enjoyed Shayna Baszler and Dakota Kai’s match a lot. Punishment Martinez didn’t receive a big debut and didn’t seem pegged as a big deal coming in. I get the sense the honeymoon period of Matt Riddle entering NXT is ending and they should be airing those documentary-style features on Riddle’s struggle on the independent scene, fighting for his family and providing depth to the character beyond the catchphrase.